Harvey Milk Plaza, a place where hope will live forever! The evolved design was revealed on May 15, 2018. The new design, shown in the images below, will continue to evolve to incorporate community feedback and city family input. The memorial elements depicted here are conceptual ideas that will undergo further creative exploration and artistic development. Image above: Aerial view of the plaza (Castro Street on the left, Collingwood Street on the right with the plaza along Market Street). Image above: Starting at the Castro Station concourse level. You will certainly know you have arrived in the Castro. Vivacious ceiling lights welcome you to and from your neighborhood station. A new glass elevator provides access directly to the plaza and to market street. Located opposite to the stairs up to the street is an exhibit space where glass vitrines can feature art, or other items speaking to Harvey Milk. Visitors are invited to take a look and learn about Harvey and the LGBTQ history. Also, an interactive digital wall brings online users closer to Castro. A window allows you to look down at the station below. 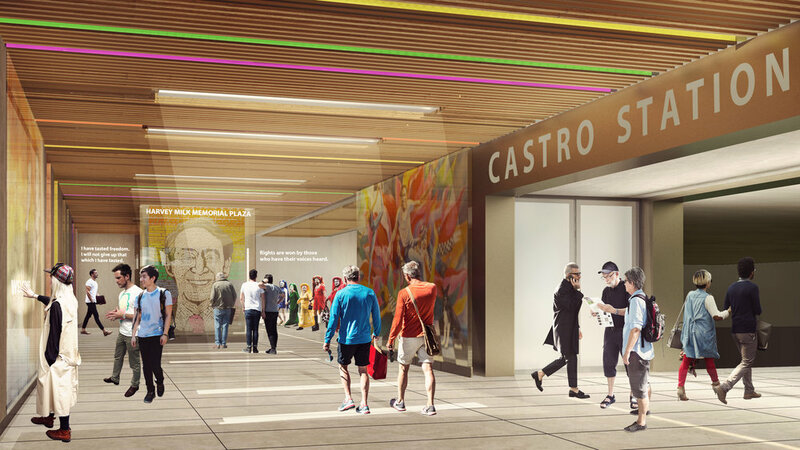 Image above: As you exit Castro Station towards Castro street, the colorful ceiling lights and artwork follow you towards the daylight and a roof protects you from wind and weather. This roof cover protects the escalator from weather and allows for a roll down gate to secure the station entrance at night which further helps maintain the operability of the escalator, meaning it will experience less downtime. Image above: View from the corner of Castro & Market Streets toward Collingwood Street, view of Gilbert Baker's flag, Twin Peaks and Sutro Tower and the iconic building (on the left) at 400 Castro Street. Image above: Vantage point from the lookout area of the canopy. Image above: Here is an aerial view of the plaza at night. You can see the rainbow flag illuminated above the plaza, with the memorial components glowing throughout the site, but will still allow effective gathering space, as well as commuter access at all times of day. Through these various design moves, we hope to create an efficient transit station, safe and lively plaza, and a peaceful contemplative memorial.